Squirrels are not only amusing in nature but also an important part of the ecological hierarchy. Most of us really enjoy watching a squirrel playing or eating at a wooded suburban park or forest. Commonly, squirrels are found in bushy forested areas. They can also be spotted in our backyards. Feeding squirrels can be a fun and favorite activity among all age groups. But you can only do that if you attract the squirrels to your backyard. Therefore, you might like the idea of creating a backyard habitat for squirrels. Even if your backyard is not a typical wooded suburban forested property with numerous nut-producing trees, you can still create a cozy and perfect habitat for the elusive squirrels. Here are some tips for attracting the squirrels to your backyard. How can you attract squirrels to your backyard? For any living creature, food and shelter are always the first priority. A squirrel, like other rodents and mammals, loves to stay in a comfortable nesting site with enormous food options around. Hence, the best ways to attract squirrels to your backyard is by creating a nesting site for them and offering them food. Commonly, a number of people feed birds in small feeding areas in their backyard. Most of the time, they find squirrels in those feeding areas as well. If you want to attract squirrels to your backyard, all you need to do is to hang a platform bird feeder from any tree branch. Then you can place some sunflower seeds, shelled nuts or acorns in these feeders. There are possibilities that you may not see these rodents coming immediately, but surely you will catch a glimpse of this elusive rodent anytime before dusk. Be patient when you are attracting these rodents with food. Don’t use flashlights as squirrels get distracted and will avoid coming to the feeding spot. Initially, you will find only one or two inquisitive squirrels; gradually, the number rises as more of them come to your backyard bird feeding area and soon you will spot a whole bunch of squirrels playing in your backyard and eating the nuts. Apply a handful of peanut butter on tree branches. It is commonly found that the peanut butter mixed with bits of sunflower seeds appeals the flying squirrels. Though the normal squirrels are not very keen on peanut butter, they also get attracted with peanut butter smothered trees. You can spread it on any tree in your backyard. Eventually, you can plan to do the same on small branches in different trees for feeding these mysterious animals. There are many instances when you find a dead tree in your backyard or any nearby forested area. Using such a tree log for creating a habitat for the squirrels is one great option. Usually, the squirrels are cavity squatters and that’s the reason they use holes created by other animals for their habitat. You can clean the dead tree by trimming the complex branches and use it as a habitat for the squirrels. In winter, these tree logs are best places for the squirrels to get warmth as they do not hibernate. As squirrels love to dwell inside the cavities often made by the woodpeckers or other animals, they easily adapt to nest boxes. You can use the bird nest boxes for squirrels as well. You will find a number of low-priced ready-made bird boxes for bluebirds, wood ducks and screech owls easily in the market that you can also use for the squirrels. Typically, a 7 inch by 7-inch bottom and 8 to 10 inches tall box is best for the squirrels. Ensure that the nesting cavity hole entrance should measure somewhere between 4 inches to 6 inches for all types of squirrels. You need to mount the nesting box on a pole or on a tree. 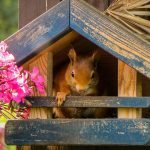 If your backyard is full of small trees, then using a nest box for the squirrel is one favorable option. This is because, by providing food and nesting places to them, you will be able to catch a glimpse of these amusing acrobats. Undoubtedly, you and your family will delight while feeding and watching these endearing petite furry creatures. Believe it or not, the squirrels with their unique scurrying, gathering and entertaining nature are considered as one of the top entertainers in the animal kingdom. Use shelled nuts for the squirrels rather than using peanuts and corn. Feed the squirrels adequately but not excessively. Arrange some water options for the squirrels in your backyard. Seek a veterinarian’s help for injured squirrels. While placing a nest box, ensure that the box is predator safe, especially around birds and cats as they attack squirrels often. While placing the box, check the roof and the bottom to ensure that it’s safe from any external attacks.